Slideshow means flow of different photos. Slideshows makes your blog look good. Adding slideshow is very easy in blogger but adding custom show is not easy. Adding a slideshow is as easy as abc. For adding a slideshow go to blogger login to your account go to layout click on add a Gadget click on slideshow and choose the one. But if you want to add a custom slideshow(a slideshow having your choosen images) you need to have an account at Photosnack. Go to Photosnack and register a free account. Photosnack is a site which allows you to create your own slideshows which is very easy to make and looks professional. Slideshows made at Photosnack are mobile-friendly. 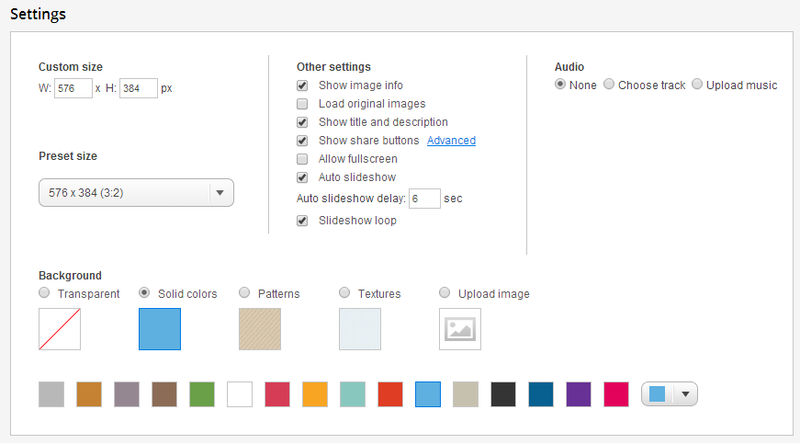 Here are some steps to make your own slideshow for your blog or website. (1). Go to Photosnack, if you already have an account login and if you are new then register for free. (2). Now login to your account and click on New slideshow and upload your photos. (3). When the upload completes click next to proceed to next page. (4). Your slideshow is ready now click advanced settings here you can name your album, add description and add more photos. (5). When you are done click next to customize your slideshow, here you can choose a template for your slideshow, see in below image. (6). After choosing a template you can furthur customize your slideshow such as changing backgroud color, customizing size, adding a background audio, leaving the background transparent, allowing full screen, slideshow delay time, show social share buttons, show or don't show title and description etc. When you customize your slideshow then click finish to proceed. I hope this was easy and helpful, if not ask me in comments. Share this post please. Follow and subscribe for new updates.